Bag-in-Box packaging is a great way to extend shelf life of your juices. On the outside you have a high quality corrugated cardboard box to provide strength and protection during transportation. 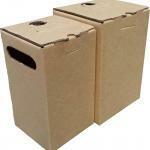 A high visibility print or craft box will attract customers in the respective purchasing environment. On the inside you have a 3 layered, BPA free bag, guaranteeing an oxygen barrier. The special Vitop Valve will release juice upon opening, but prevents air from entering the bag, thus keeping the product fresh for up to 2 months after opening. Unopened, most juices have a shelf life of 1 year. 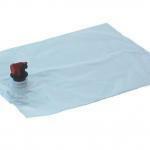 We stock the highest quality Bags for Bag-in-Box with a Vitop Valve. Our 3 layered film is guaranteed to have an oxygen barrier layer in the middle. The inside layer is BPA free, where the outside layer provides strength for transportation. The valve keeps air out of the bag during pouring, as the bag collapses as it is emptied. This will guarantee the content stays pasteurized, with no new oxygen contaminating the juice during the pouring process. Available in 3, 5, 10 and 20 Liter Bags, center spout. Over the years we have improved our boxes, and have come up with a sturdy box, high grade corrugated cardboard, and a improved valve notch design. These are available with flexo and litho custom printing on it. If you are looking for special sizes, please contact us and we’ll special order them for you. Available in 3 and 5 Liters, center notch.